If you love nature and the countryside, the PeruRail Vistadome is exactly what you’re looking for. The PeruRail Vistadome* train offers a unique connection with the scenery along the way to Machu Picchu, making passengers feel as if they were somehow part of the nature that surrounds them. Return trips on the PeruRail Vistadome also offer an onboard fashion show, featuring the exclusive baby alpaca wool collection with the latest trends in alpaca apparel, all available for sale. 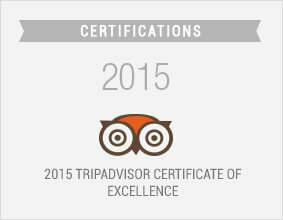 As an added bonus, you can enjoy live dances inspired by the ancient culture of the Andes. Passengers also receive a snack made from local ingredients, so you can get the full Andean experience through our cuisine. The trip also includes non-alcoholic beverages for your onboard refreshment. Departures are scheduled every day, with a variety of schedules and frequencies*. For more information on what is and is not included, depending on the type of trip (inbound or outbound only, roundtrip) we recommend reviewing the “Service Details” for the PeruRail Vistadome train by clicking here. (*) PeruRail Vistadome 601: Arrival at the Belmond Hotel Rio Sagrado at 07:02 hs. Departure at 07:12 hs to the Machu Picchu train station. Exclusive stop for hotel guests. PeruRail Vistadome 304: Arrival at the Belmond Hotel Rio Sagrado at 18:21 hs. Departure at 18:31 hs to final destination Urubamba train station. Exclusive stop for hotel guests. 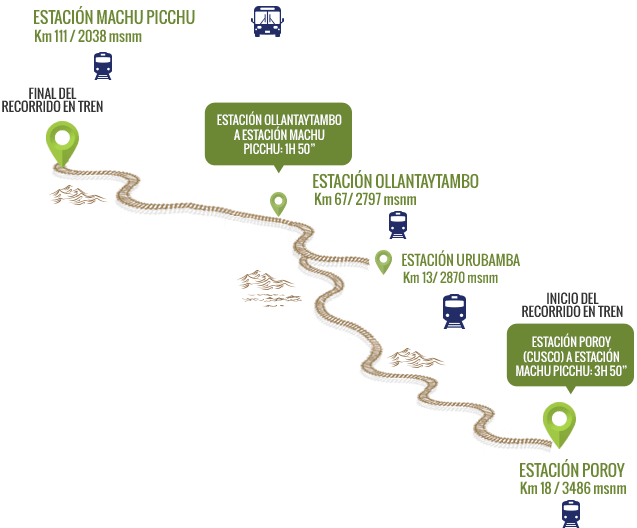 PeruRail informs its passengers that the concessionaire in charge of the administration and maintenance of the railway determines the closure of the route between km 44 and km 61 that leads to Machu Picchu departing from Poroy (Cusco), therefore all train services on the route must operate on alternate roads. For that reason, in compliance with a regulatory measure, between January 2nd and April 30th, 2019, we will implement a Bimodal Service that combines bus and train journeys. 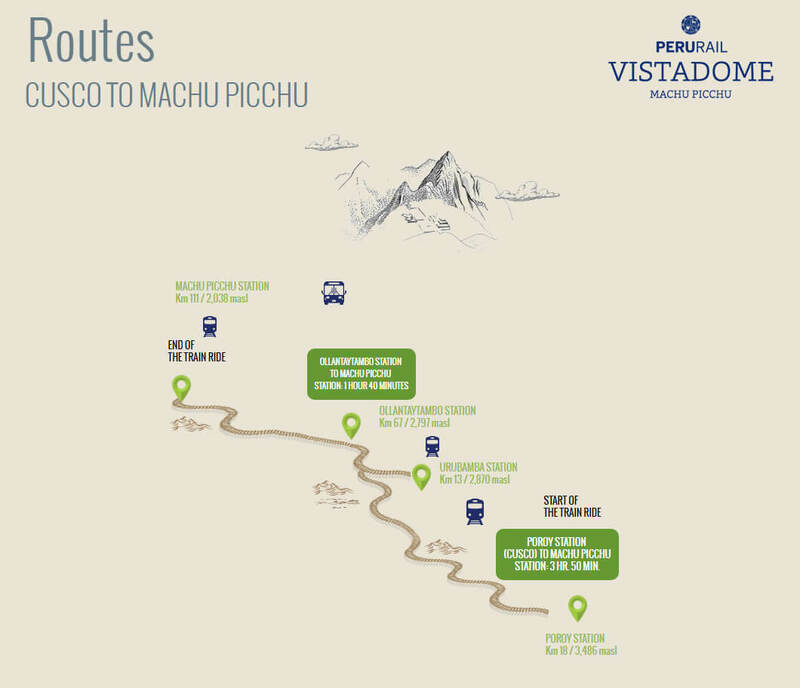 During this period, passengers travelling through our train services Cusco – Machu Picchu – Cusco must board a private bus departing from Wanchaq train station, located 5 minutes far from the historic center of Cusco, in direction to Ollantaytambo train station (Sacred Valley). In this point, passengers will transfer to the train of their choice to Machu Picchu. The inbound journey will be carried out in reverse direction. 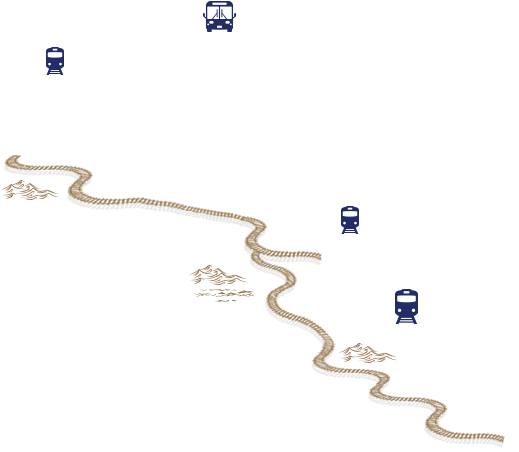 For passengers traveling in our Belmond Hiram Bingham luxury service, the transfer point will be at Belmond Hotel Rio Sagrado located in the Sacred Valley and the inbound journey will include the transfer to passengers´ hotels located in Cusco’s city center. For more information click here. Station: 3 hr. 50 min.